My sister always says one thing when it comes to jewelry, “I need more jewelry in my life. Clairee in ‘Steel Magnolias’ says,” The only thing that separates us from the animals is our ability to accessorize.”” I agree, I also need more. I need to accessorize more. It’s not that I don’t have enough. But you always need that something that will pop up any look. Sometimes, in a pile of jewelry, you just can’t find it. And as you are reading a sentence that’s been said/written in more than a million posts. It’s the simple truth. 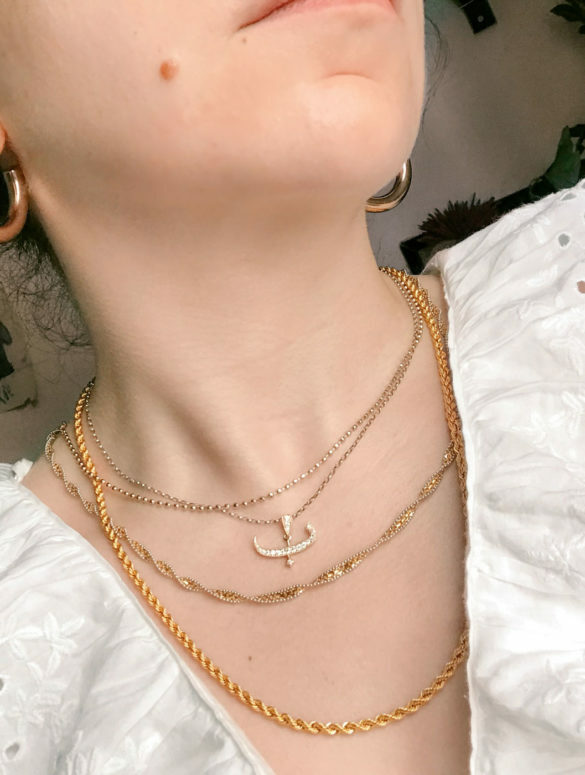 Jewelry is the one of those things that will make you stop at that detailed shot while you are scrolling Instagram, zoom in to eye how many necklaces that french girl is layering and to see what you need to copy from such a pixelated look. You save it in your “things I wanna purchase” file and never get back to it. 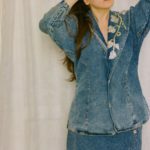 These are the best jewelry brands I’m eyeing right now, And from a pile of brands I see on Instagram daily, I find them better than“ just save and forget about”. Very sculptural pieces for the days you want to say, I’m bold but in a very different way. Pieces that can take you more seconds to contemplate its images, to know where it starts and where it ends. That will make you think, can I turn it into a real sculpture, maybe an industrial building!? We used to know pearls as classic pieces, that you can wear for a romantic touch that you don’t necessarily need every day. Today, we modernized pearls that they became the new fun piece. It’s a conflict I like my mind to have every time I see Wald Berlin pieces. I discovered Missoma when Lucy Willams collaborated with them to create the timeless Roman coins collection. The necklaces look great layered with other necklaces. It is definitely one of those I have saved and did not forget about. Hence, here it is! I love when a brand creates a solid shape that makes a huge impression with people. 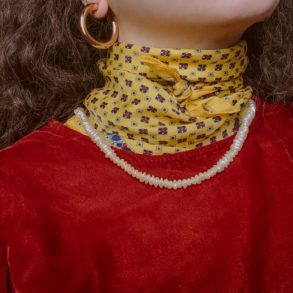 The Onia necklace and the Gold Pearl necklace are so good that you can point out from a stack of layers. I love it for that. And their hoops and rings are essentials but bold. The kind you will wear everyday and never takeoff. I found out about this brand via Blanca Miro, when she collaborated with it to bring us the Rainbow collection. The brand is so versatile in its designs and so easy to style with everything. I can picture myself mixing the new collection YIN LOVE YANG pieces with BLOOMLAND (a previous great collection). You can pre-order this specific necklace from Vasquiat and send it to me as a gift. It will look perfect for spring (groundbreaking!) or for any other season for a paradoxical effect. And if you ran out of ideas, well, you have Blanca to show you how to style it with every look. PS: The Jewelry I’m wearing here are not from a specific brand, they’re solid yellow and white gold finds I have collected for years. The last piece added is the letter “ب” which is “P” in Arabic, which I’m very, very happy about.